The International Congress of Mathematicians (ICM 2010), a quadrennial affair, began today in Hyderabad, India. The opening ceremony lacks the grandeur of recent Olympics extravaganzas, but it does bring the awarding of Fields Medals to the latest winners. As explained at the website of the International Mathematical Union, “The Fields Medal is awarded every four years on the occasion of the International Congress of Mathematicians to recognize outstanding mathematical achievement for existing work and for the promise of future achievement.” The medal is generally considered the mathematical equivalent of the Nobel Prize. To confuse matters, the Norwegian government established a mathematics prize in 2001 to serve explicitly as the mathematical version of the Nobel Prize. It is called the Abel Prize and has been awarded annually since 2003 by the Norwegian Academy of Science and Letters. (The prize’s eponym, Niels Abel, was a Norwegian mathematician who would make anyone’s list of the greatest mathematicians of all time and who died of tuberculosis in 1829 at the age of 26.) I wrote posts about the two most recent Abel Prize recipients, Mikhael Gromov and John Tate. Whichever prize is more Nobelic — and anyway, who cares? — they do play different roles in the profession. The Fields Medal’s dual mission of recognizing outstanding achievement and promise of future achievement has come to be interpreted to mean that recipients not be too far along in their careers. Specifically, they should not be over 40. Enough background. 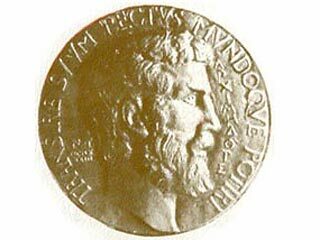 You can read about this year’s four Fields Medalists by going to the prize webpage at the ICM 2010 website. They are Elon Lindenstrauss of Princeton University, Ngô Bảo Châu of Université Paris-Sud, Stanislav Smirnov of Université de Genève, and Cédric Villani of Institut Henri Poincaré. I don’t yet see an ICM press release providing general background on the four recipients, so I can’t link to it. What you can read now, at the prize webpage that I just linked to, are descriptions of their mathematical work written by other mathematicians. Don’t expect to understand too much. Maybe return later when there are biographical sketches. In any case, this is a day mathematicians around the world eagerly await, ending months of speculation about possible winners. I didn’t want it to pass without mention.